G: Phelddagrif gains trample until end of turn. 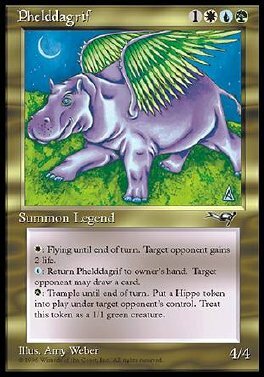 Target opponent puts a 1/1 green Hippo creature token into play. W: Phelddagrif gains flying until end of turn. Target opponent gains 2 life. U: Return Phelddagrif to its owner's hand. Target opponent may draw a card.